This corded necklace is made using Satinique cording for a beautiful piece with some beautiful shimmer. It measures 18 inches with a center jeweled piece that adds 2.5 more inches. It is done in a silver and fuschia. 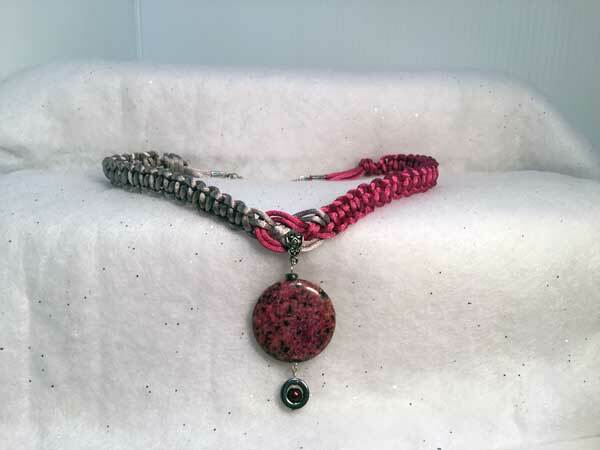 The focal bead is a large rose and fuschia and coin bead with specks of black throughout. Hanging separately from that is a hemalyke donut with a cranberry round in the center. The piece is finished with a lobster claw clasp and extra chain for added length.